This Mr. Boise is a civil courteous man, and is 54 years of age, being born at Heddington Quarry near Oxford in the year 1673. It is possible that he grew up at Barton Manor in what is now Barton Village Road: he certainly owned this house, as it was put up for sale by his widow a few years after his death. Boyce was an Oxford mercer, and he first came on to the Common Council on 30 September 1703.
probably the one of that name buried there on 24 July 1719). In March 1706 Boyce took on John Crooke as his apprentice. In September 1706 Boyce was elected Junior Chamberlain, and in September 1709 Senior Bailiff. On 21 February 1718, and again on 21 July, he was fined a shilling for coming to a council meeting without his gown. In 1719 Boyce was granted a lease by the council of a house in Oxford opposite St Mary-the-Virgin Church in the High Street, at a rent of 26s. 8d. and two capons. This would have been Boyce’s shop as well as his home, and had formerly been occupied by another mercer, Thomas Fifield. Salter identifies the premises as two former small houses (the one to the east belonging to the city council and the one to the west to Magdalen College) which by 1624 had been rebuilt and made one large new house. In July 1722 Boyce was chosen as one of the eight Assistants on the Council, and in September 1722 was elected Mayor of Oxford (for 1722/3). As his only son was still a child, he chose Hercules Osbaldeston, a young chandler, to be Mayor’s Child and made him a Chamberlain. The following July, during his mayoralty, Boyce was elected an Alderman. On 7 July 1727 Boyce’s only surviving son, John, was matriculated at the University of Oxford by Christ Church at the age of 16. It appears that he was taught by Charles Wesley. In September 1727 Alderman Boyce was elected a second time as Mayor (for 1727/8). According to Thomas Hearne, he was opposed by Alderman Henry Wise who lost by a great majority. He selected George Wentworth as Mayor’s Chamberlain and John Dandridge as his Child. The claim of the city for the Mayor to serve in his customary role of butler was at first “rejected by the Court of Claims of Geo. II., being not agreable to any since the Restoration”; but it was eventually allowed, and Boyce attended the coronation of George II “en l’office de Botelary” on 11 October 1727 and was duly knighted. On Thursday last (being the 26th inst. ), Sir John Boyce, Knight & Mayor of the City of Oxford, was married at Christ Church to the Widow Holmes, a Woman of near 70 Years of age (all agree that she is 67), who hath lived for some time in St. Peter’s Parish in the East, where she had furnished a House very finely. being a very ambitious, proud, lecherous Woman (that she might be a Lady), she married Sir John Boyce…. Sir John hath only one Child (by his first wife, who died but on March 22nd last), a boy, of about sixteen years of age, who is now Commoner of Christ Church. By this marriage Sir John thinks to get a farther advantage, and that is, to have his son married to Mr More’s daughter (a very pretty girl) & only child. Mr More is very rich. “Mr More” was the husband of Mary’s sister, but this marriage never happened. In September 1732 Sir John was again elected Mayor, but this time he asked to be excused, paying the mandatory fine of £50. 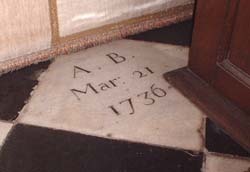 Boyce’s son John Boyce junior obtained his BA in 1731 when he was 20, and that same year (the precise date is missing from the register) he married Margaret Hudson at Cowley. She was the only child of Dr John Hudson (Principal of St Mary Hall and Keeper of the Bodleian Library, 1662–1719) and his wife Margaret (daughter of the former mayor Sir Robert Harrison). It appears that they went to live in the house in Oxford immediately to the west of that of Sir John Boyce. Hearne reports that a court case on 9 June 1733 brought by the Revd Mr Goole, a schoolmaster of Witney, regarding a breach of contract prior to John Boyce junior's marriage to Margaret. His father Sir John Boyce allegedly gave Goole £200 “not to stir the case”, and on the day of the marriage John Wesley, who later acted as an envoy getting legal advice in London, recorded in his diary, “Mr. B. married Mr. G.’s wife”. The judgment came down in favour of Boyce, Sir John had the bells of St Mary the Virgin rung for joy, and the Vice-Chancellor requested that a local bookseller sold no transcripts of the case. 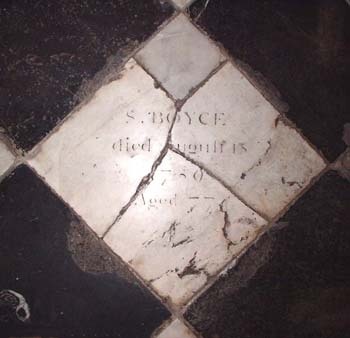 On 21 March 1736/7 his second wife Mary Boyce died at the age of 73 and was buried at St Mary-the-Virgin Church on 24 March. 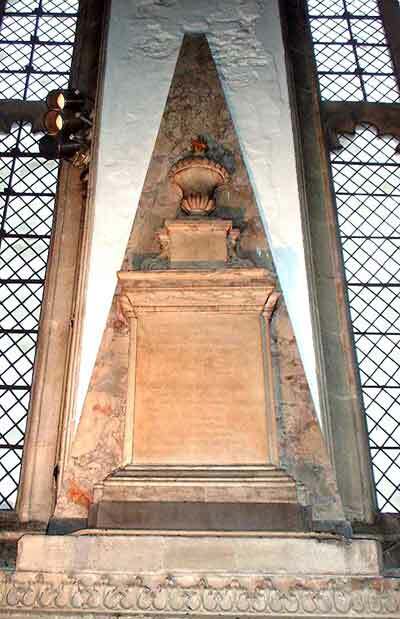 The triangular memorial to Mary on the wall of St Mary-the-Virgin Church (left) describes Mrs Boyce in Latin as “Anna”, and gives her date of death at the age of 74 as 21 March 1736/7; Yet the burial register confirms that she was actually called Mary. Once again Boyce did not remain a widower for long: in 1738 at St George’s, Hanover Square, when he was 65, he married his third wife, Sarah Bayley of Exton, Hampshire. Sarah, described as a spinster, would have been about 64 at the time of the marriage. Oxford, Oct. 27. Last Night, Sir John Boyce, Mayor of our City, receiv’d his Majesty’s Writ and Declaration for proclaiming War against the King of Spain: The next Morning he ordered a meeting of the Aldermen and the rest of his Brethren, to attend him at the Guildhall, and there signifying to them the Occasion, it was unanimously agreed to proceed at Two in the afternoon (before which Time the Streets, being the publick Market-Day, would be fill’d) to proclaim the said declaration on horseback in the following Manner: First the Drummers and Trumpeters were order’d to ride two and two; after them Mr. Mayor’s Officers, and the Bailiff’s Serjeants at Mace in their long Cloaks; next the Town Clerk, and the Macebearer bearing the Mace, and then Mr Mayor, the Aldermen, assistants, Bailiffs, and the Members of the council-Chamber, two and two, according to their Order and Seniority in the House. At the Time appointed they met at the Public Hall on Horseback, the Mayor, Aldermen, assistants and Bailiffs, robed in their Scarlet Gowns, and the other Members of the Chamber in their Black Gowns, and so proceeding in regular Order, the Drums beating and Trumpets sounding to the Market-Cross, (Proclamation being first made by one of the Mayor’s Serjeants at Mace) the Declaration was read; after which there was such a general Shout and Acclamation of the People, who appear’d in such incredible Numbers, crying out God save the King, and Success to his Majesty’s Arms, that the publick Streets became almost impassable, and the People shew’d a thorough Satisfaction in being confirmed now in what they had so long desired. From thence they proceeded in like Manner to the four Gates of the City, at every one of which the said Declaration was read, being still attended with an innumerable Company of People, the Country joining with the City, who all the while continued their Shouts and Acclamations. Mr. Mayor after this, with his Company, returned to the Hall, and concluded the Evening with drinking a Glass of Wine to his Majesty’s and his Royal Family’s Health, and Success to his Majesty’s Arms. It was generally taken Notice of throughout the whole City, that there never before were seen such Demonstrations of Joy shew’d upon such a solemn and extraordinary an Occasion. In 1746 The Monthly Chronologer has the following entry in its list of “Persons declar’d Bankrupts: “Sir John Boyce, of Oxford, Knight, Mercer, Draper, and Dealer”. It looks as though his son may have bailed him out, as in March 1747/8, the lease on Sir John’s shop is described as being held by “John Boyce of Saintbury in Gloucestershire”. † Alderman Sir John Boyce died in September 1755 at the age of about 78. Enquire of Lady Boyce in Oxford, or John Oliver at Heddington Quarry. Just six weeks later on 13 August 1859, Lady Boyce was dead. On 6 August 1734 “John Boyce of Blechington”, clerk, was granted a 40-year lease of newly erected messuages in Oxford that lay between a tenement of University College in the tenure of Richard Long, hatter to the west and a tenement of Magdalen College in the tenure of John Wollumes, grocer to the east. Soon after this, John Boyce junior left Oxford with his wife Margaret to become rector of Saintbury in Gloucestershire. They had eight children: their first child survived to young manhood; two other boys, including their second child, William, entered the Anglican ministry and served their father’s parish for a time; and three of their sons died in 1748. His only daughter married a Gloucestershire Rector, the Revd Scott, at Copthorn, Worcestershire. The Revd Boyce died at Saintbury in 1776, seventeen years after his wife Margaret.